During their daily walk before work, Superintendent of Newington Parks and Recreation Bill DeMaio and his German shepherd Izaac cross busy Route 175 with only one set of eyes. Guide dog Izaac is a life partner and lifeline to DeMaio, who is legally blind. DeMaio puts complete trust in his service animal, along with hundreds of thousands of other disabled people in this country who put complete trust in their service animals. The group is protected under the Americans with Disabilities Act (ADA), the Air Carrier Access Act and the Fair Housing Act. Legal provisions allow them to be accompanied by their animals in planes, restaurants, hotels and housing where animals are otherwise prohibited. Connecticut law only recognizes dogs and miniature horses as registered service animals, and requires them to wear an orange collar or harness to gain public access. Accommodating facilities may not pose questions about a person’s disability or ask to see certification. They may only inquire whether yours is a service animal and what tasks it performs. Then there are Emotional Support Animals (ESA), which provide therapeutic benefits to their owners and relief from conditions like depression, autism, social phobias, bipolar disorder and other mental illnesses. The ADA does not offer protections to people with an ESA, although they are covered under the Air Carrier Access Act and Fair Housing Act. A letter from a licensed therapist or prescription from a mental health professional gives an ESA credibility. An uptick in the number of animals travelling as Emotional Support Animals on flights has recently led airlines to begin instituting policies the last few months. JetBlue, for example, banned hedgehogs, spiders and tusked animals in early June. The airline now requires ESA-toting passengers to provide three forms of documentation, including proof that the animal has been trained to behave appropriately in public. American Airlines, United and Delta released similar regulations in the last month. The concern is passenger safety, airlines have said. Not every animal with a vest and harness has the training this gear represents, and not every handler has a legitimate disability. In fact, the equipment and certification for ESAs is now readily available over the internet, with little to no verification. ESADoggy.com claims to be one of the few “real” sources, providing ESA letters in two days. Customers must first purchase a mental health intake exam before they are assigned to a therapist in their area, who conducts a video or telephone therapy session. If the need for an ESA is determined, a letter of recommendation is delivered electronically and through the mail. The site also has a blacklist pertaining to vendors they suggest one “avoid doing business with” including ESA Registration, Official Service Dog Registry and US Dog Registry. There is no way to track how many people have obtained these letters from the internet and how many of their ESAs are authentic or bogus. Anyone who knows them can be certain DeMaio and Izaac underwent rigorous training to become a team. Their work continues every day, seven years after their first meeting. “The training is emotionally and physically stressful but at the end it’s pure gold,” DeMaio said. Izaac knows almost 100 commands. He can locate the handicapped bathroom for his owner, lead him in and out of a subway car and find their hotel room while traveling. Walking outdoors he performs “intelligent disobedience” - refusing to let DeMaio proceed when it’s not safe, even when commanded to go forward. Countless times, he’s stopped his owner from falling into a hole or crossing a dangerous road. DeMaio took the chief parks position in his hometown in 2015 after 30-plus years with New Britain Parks and Recreation: the last decade as department head. Over the years, he’s worked triple overtime to prove his capabilities to those in doubt. DeMaio oversaw the renovation of nearly every park, pool, athletic field and monument during his long tenure in the city. Since his arrival in Newington three years ago parks facilities and programs there have grown by leaps and bounds. DeMaio’s daughter is former Fidelco trainer Laura DeMaio Roy, who hand-picked and trained Izaac for her dad. As founder of Berlin-based LEDR Dog Training, she now finds and helps people train service dogs. “As much as the dog is a partner and a teammate he’s a piece of medical equipment,” Roy tells people. She urges them not to touch or talk to a service animal wearing a harness, which jeopardizes the safety of its person. Father and daughter feel strongly about those who claim to need an ESA when that animal has not been trained for public access. She takes meticulous care to connect clients with the right dogs and help them to train for their specific lifestyle needs. With the rise in ESAs and service dogs, access has become a real challenge. Organizations like Fidelco can have a waiting list of two or three years for a service dog, which can cost between $10,000 and $40,000. This isn’t always feasible for those who already live with immense challenges, leading some to force an untrained pet to act in their service. Retired New Britain General pediatrician Dr. Ellen Leonard does not have a disability that requires a service dog. Instead, she owns one for the benefit of others. Chihuahua Ruby is a registered therapy dog with Canine Good Citizen certification. The pair travel across the region, visiting nursing homes and rehabilitation centers to provide good cheer to sick and elderly people. They also do employee stress relief at Aetna and Prudential. Ruby’s training involved sensory overload, being confronted by multiple people, smells and sounds at once. Now when put in these environments during her volunteer duties, she reacts calmly and without aggression. “When people are yelling and screaming she can let someone give her a full body hug,” Leonard said. Untrained animals might react aggressively, even to a sight as simple as a brightly-colored shirt. There is no Connecticut law on falsely claiming that a dog is a service dog, though at least 14 states prosecute false handlers. 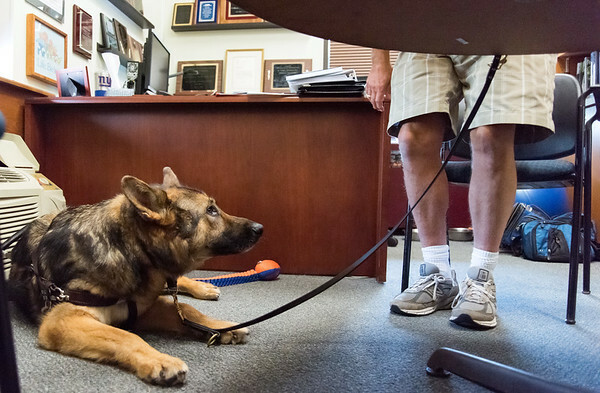 People with mobility impairments like DeMaio must obtain a dog license and tag from their town clerk, with written evidence the dog has been trained to provide the intended services. Those like Leonard, who volunteer with service animals, must also obtain a dog license and tag. State Rep. Gary Byron, R-Newington, serves on the Assembly’s Human Services Committee, which did not discuss any proposed legislation regarding service animals this year. As a dog owner himself, Byron can speak to the benefits of being around a friendly, loving animal. The distinction between a family pet and a service animal is clear to drivers traveling the main route as DeMaio and Izaac cross each morning. Posted in Newington Town Crier, Newington News on Wednesday, 13 June 2018 18:01. Updated: Wednesday, 13 June 2018 18:04.